This is my favorite type of dress to wear, so comfortable! And looks so adorable on you! This is so perfect for the summer and looks great on you. Love the hat, too! This dress looks perfect for the insanely hot southern heat! Loveeeee that hat! There really is nothing better than a great shirtdress. I have a similar one from last year that I live in! This really is the PERFECT shirtdress! I love the hat you styled with it and that gorgeous bubblegum pink lipstick! Summer perfection! Love this dress! That first picture looks like it is straight out of a magazine! Those are my favorite steal shoes, too!! Love that dress and are those the DV wedges from Target?! I almost bought them.. they are so cute!! 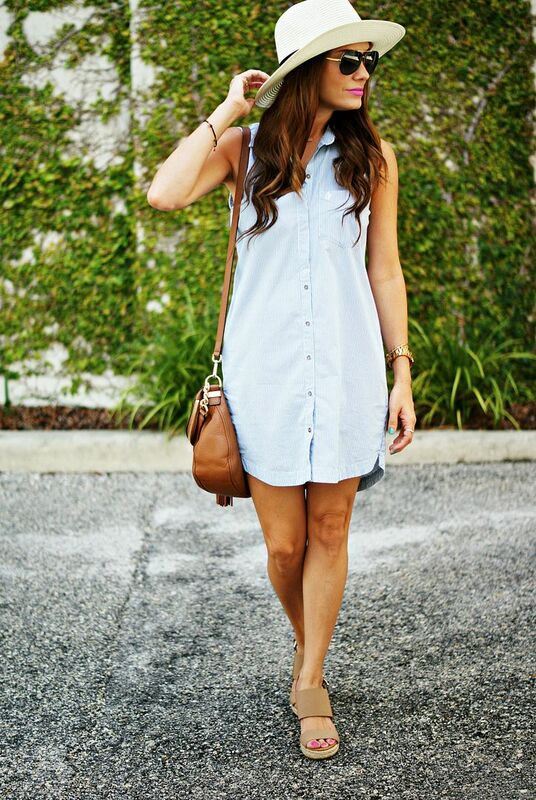 Such a cute shirtdress, and it looks so cool with all the heat! Love this hot pink lip color, too! Seriously, the perfect shirt dress - I get why you love it so much. You look great, girl! OBSESSED with this look! omg you look so chic and so effortless! What a perfect look! This is the cutest dress and I love it with the hat!! I have been trying to find a sleeveless chambray dress to no avail (pinstripes like this would be acceptable too)! Wish this color was still available! Well, don't you look adorable?! I really love this look on you and love the hat! Being sick during the summer months is just the worst. I'm so sorry girl...hope you get to feeling better soon! You look so pretty! I also love when clothing is versatile! This is by far one of my all time favorite shirt dresses! ugh! I hope you feel better REAL soon girlfriend. In better news-you look absolutely amazing in that dress...seriously gorg! You look absolutely amazing! Love that dress. Seriously obsessed with that dress, and it looks so good on you! Shirt dresses are the best - love this one! And love the shoes! This looks so comfy and adorable! I love the accessories that you paired with it including that bright pink lip! I swear Abercrombie has been having the cutest stuff lately! I love this dress and the cute button up detail! So perfect with your wedges! I hope you feel better! I'm obbbbbsessed with that lip color. So pretty on you! That dress is so cute, and perfect for being out and about in the super hot Florida summers! I love that you could dress it up or down too, based on what type of mood you're in! Bummer about being sick- and right? Being sick in the summer is the worst. I love this dress, btw. So cute and perfectly slouchy. You look gorgeous here! 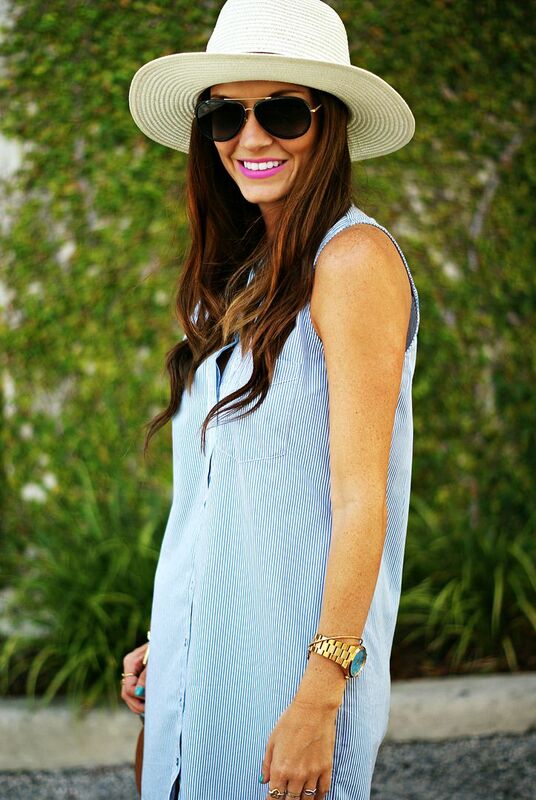 Oh that is such a cute shirt dress and easy to style up with cute accessories like TB blue mirrored aviators. I don't even know if I own a shirt dress but they're nice and breathable for this summer heat especially if they're sleeveless. That is the perfect shirtdress! I love it! And that hat too. Looks great, girl! It's so cute! That is definitely a live in dress! So many different ways to style it as well. I love stripes and love the shirt dress look. You look amazing ! I love shirtdresses, and you have the perfect shape for them! They're so classic! you look amazing, per usual! You look so gorgeous! 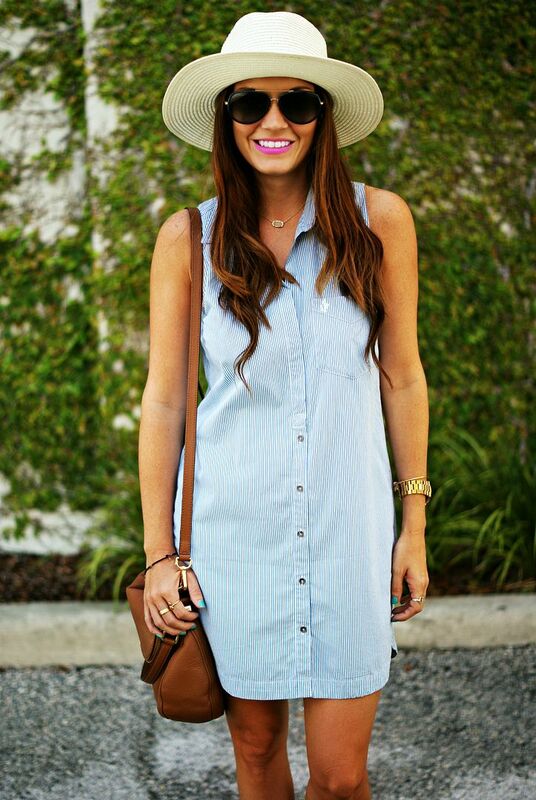 Love your shirtdress!